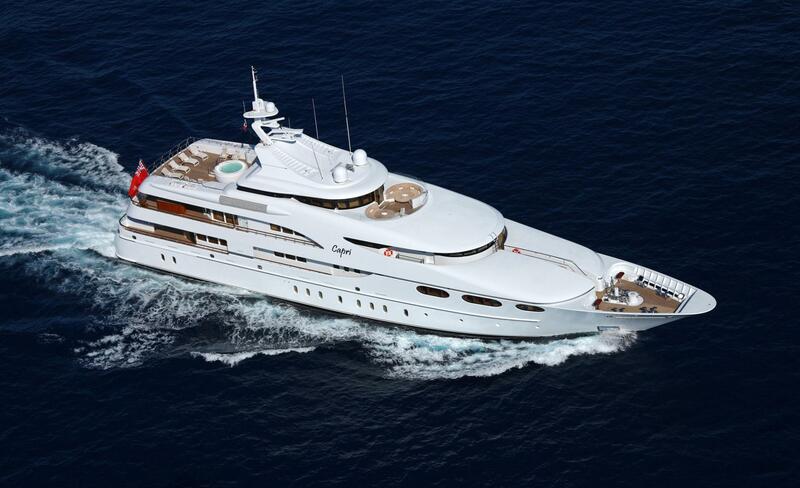 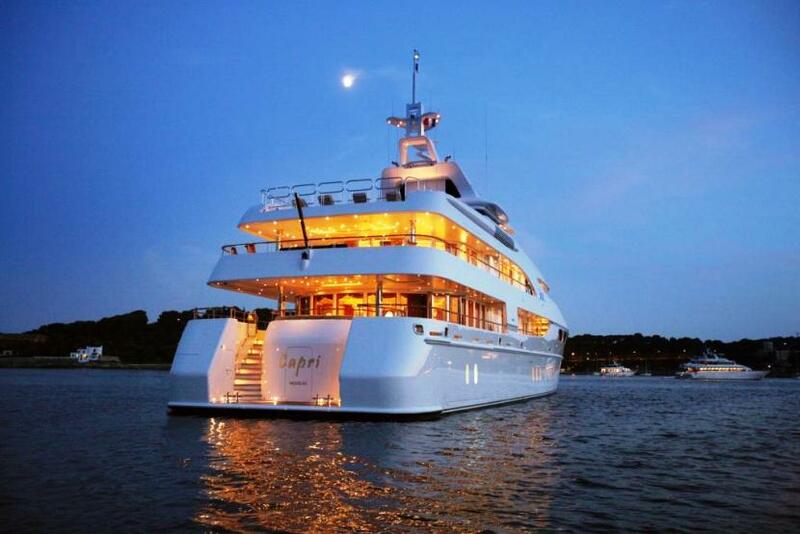 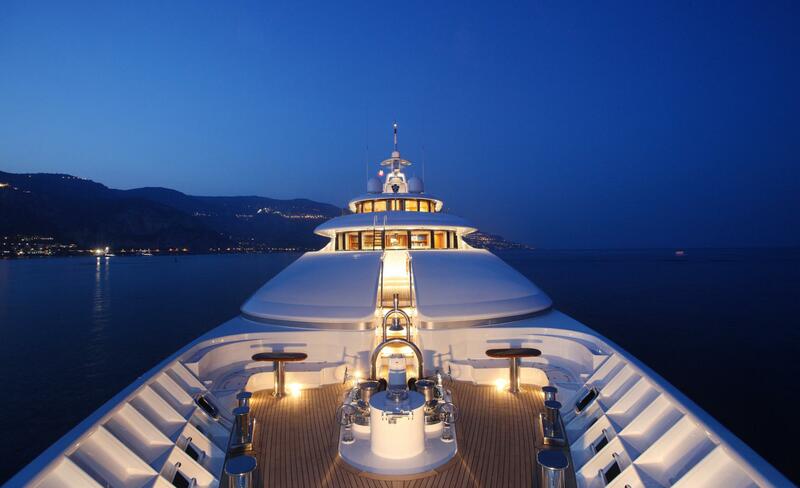 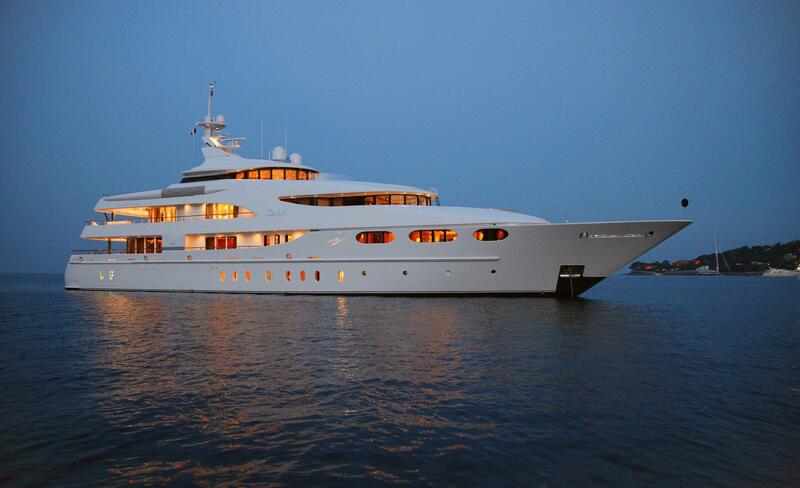 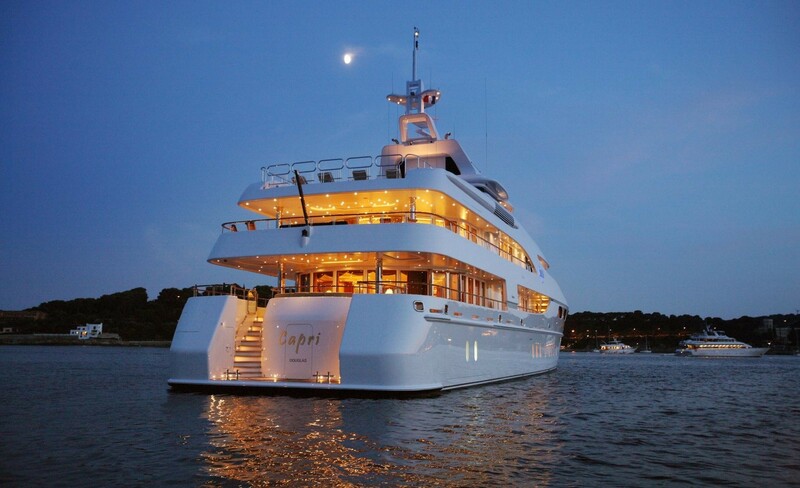 Capri was designed by Glade Johnson and built in Lürssen ship yard in 2003. 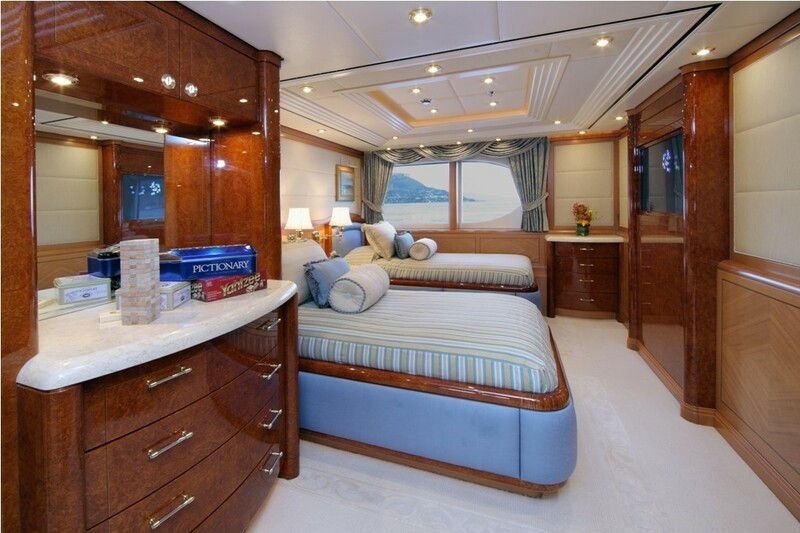 She has been built with a highly personalized touch and can accommodate up to 12 guests in 6 comfortable cabins. 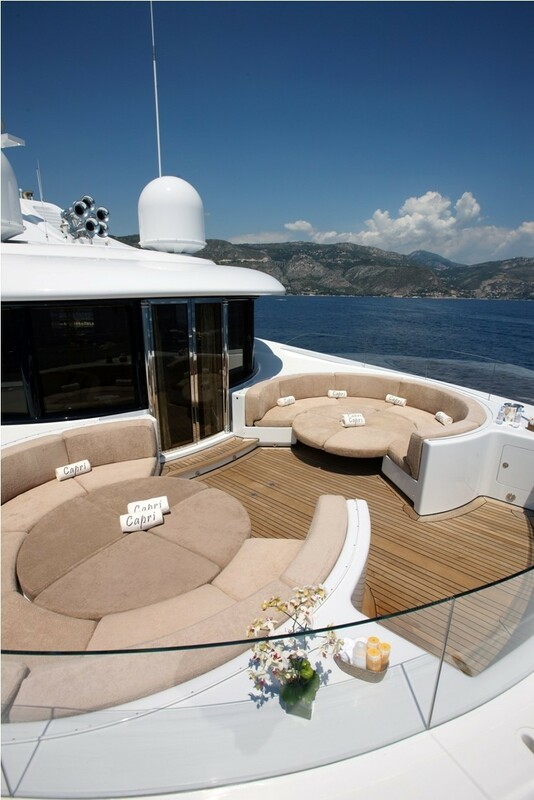 Sprawling over 5 decks Capri not only offers plenty of space but plenty of style and comfort also. 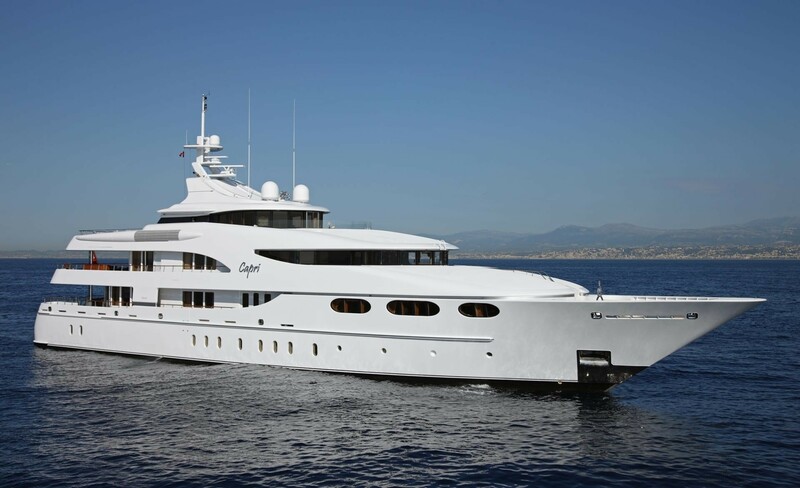 The garage for the tenders is at the stern, with two hydraulic hatches so the boats can be launched and hauled aboard with extreme ease. 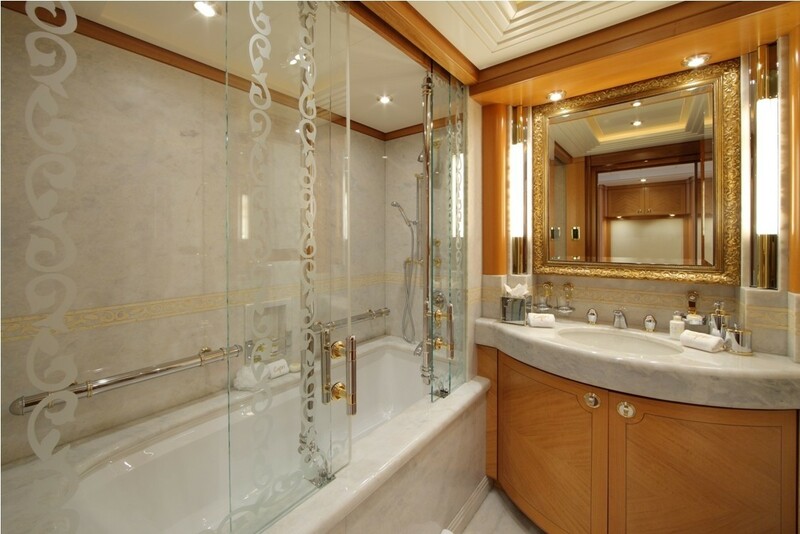 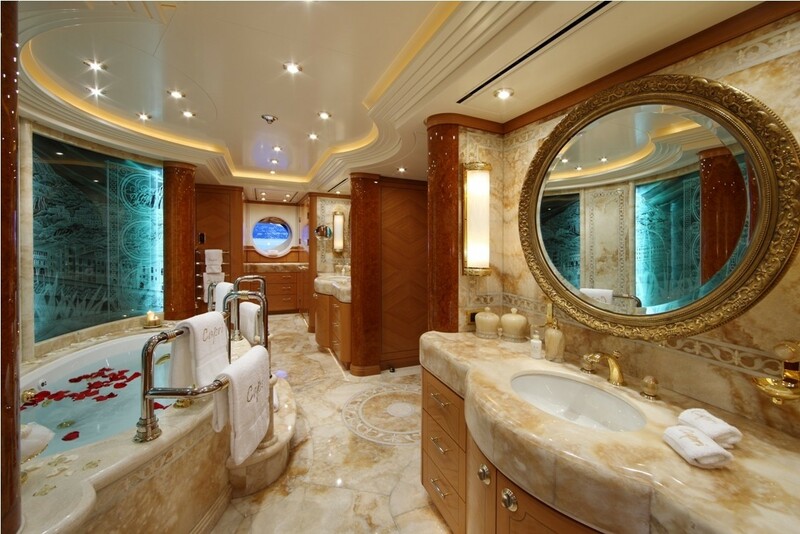 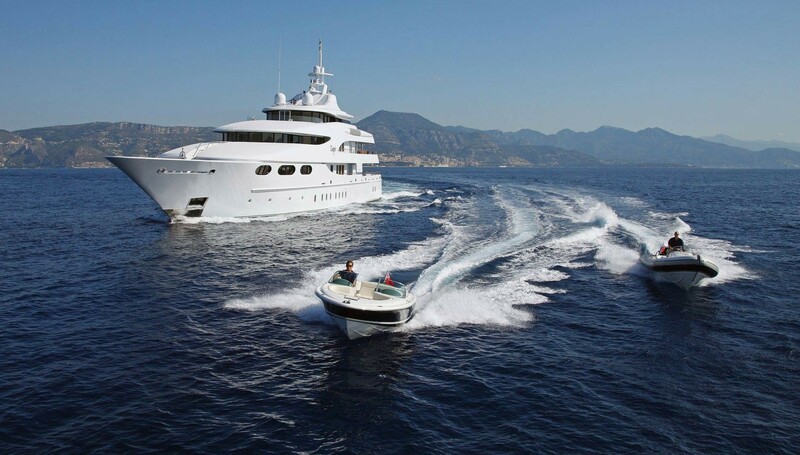 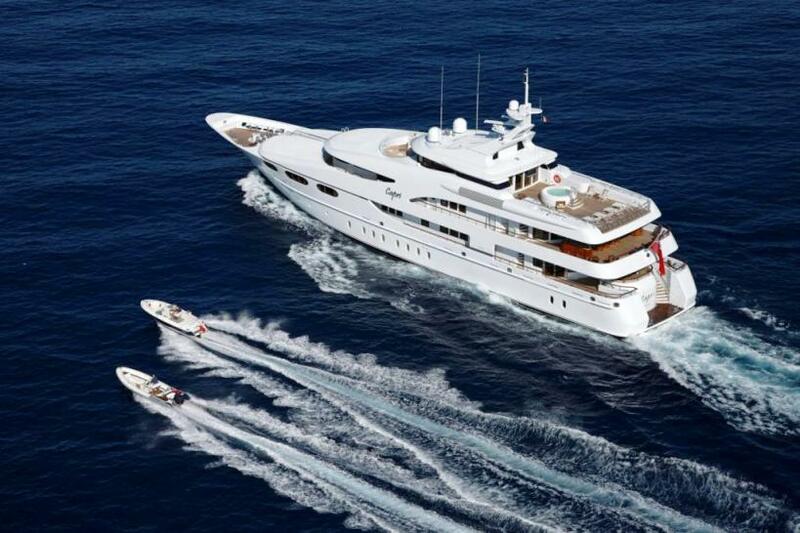 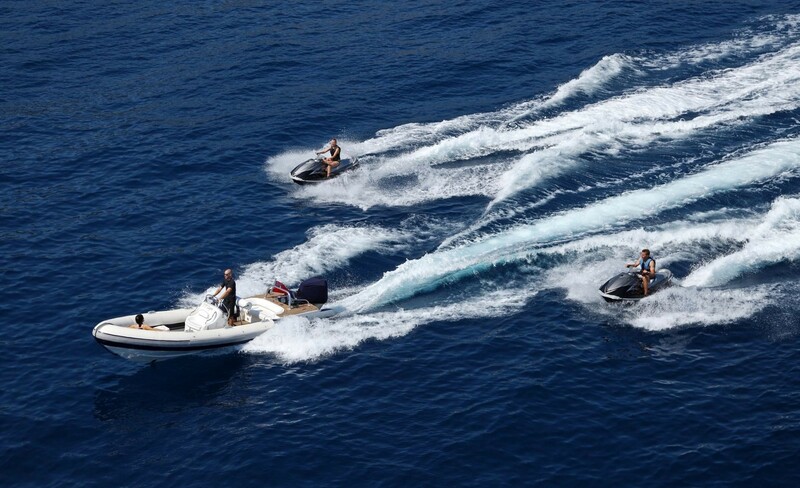 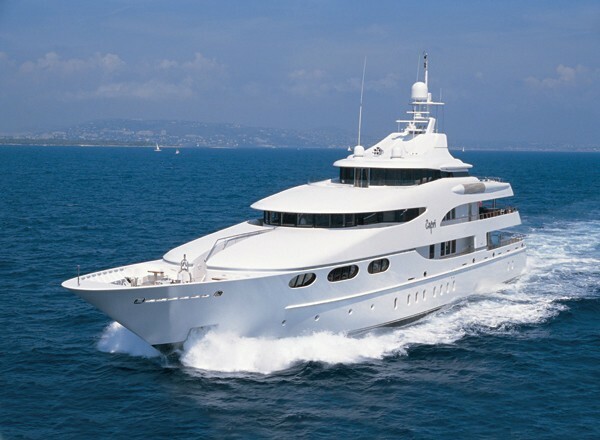 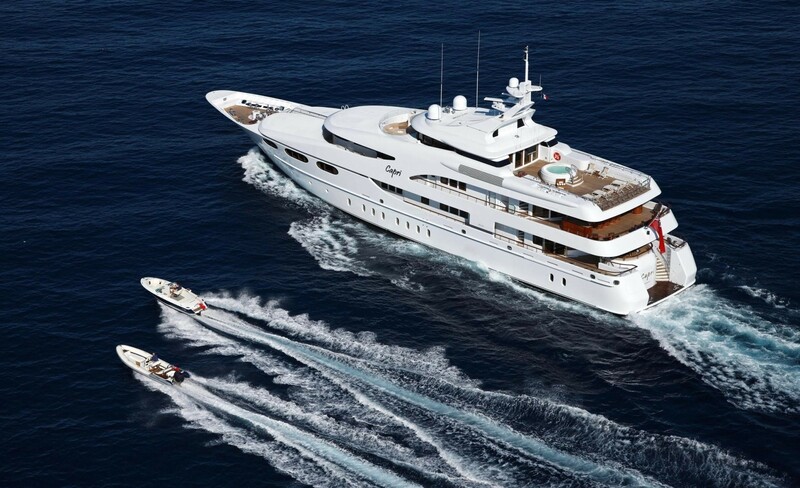 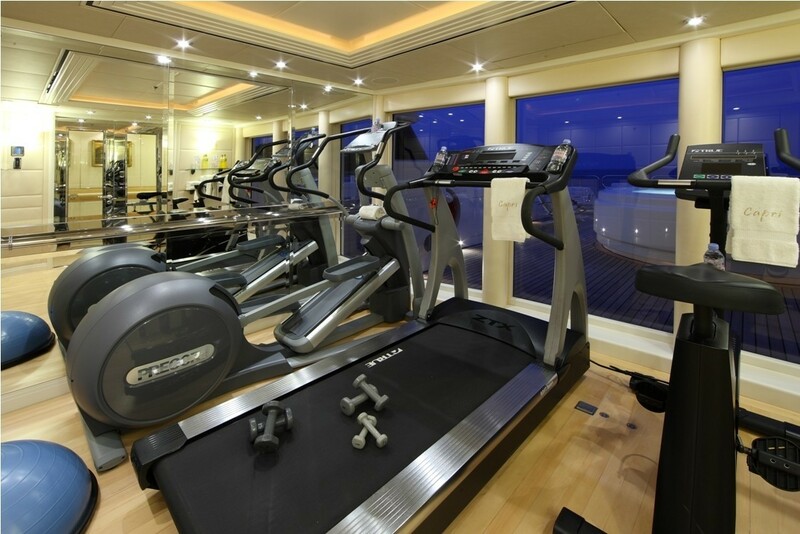 The yachts size ensures plenty of space for jet skis, kayaks, bicycles and other leisure water sports. 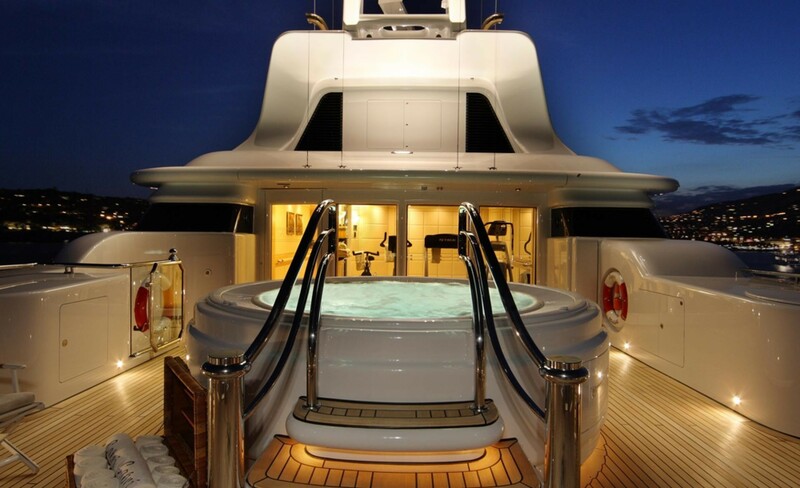 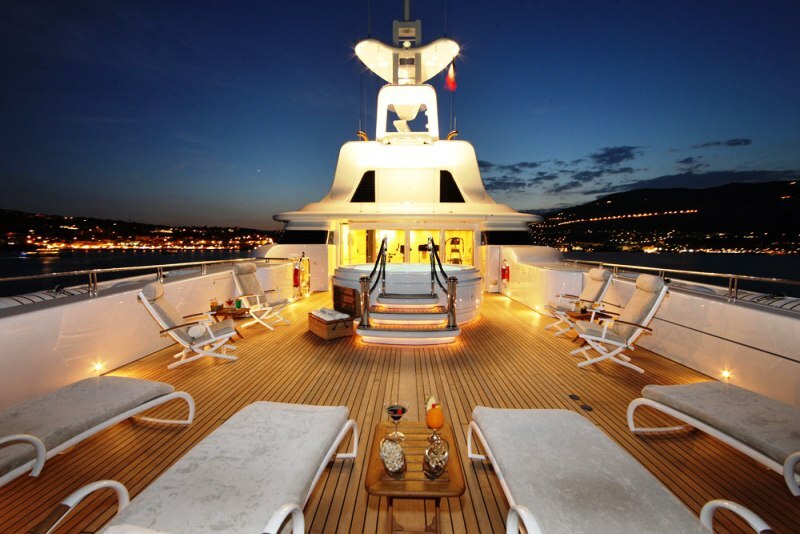 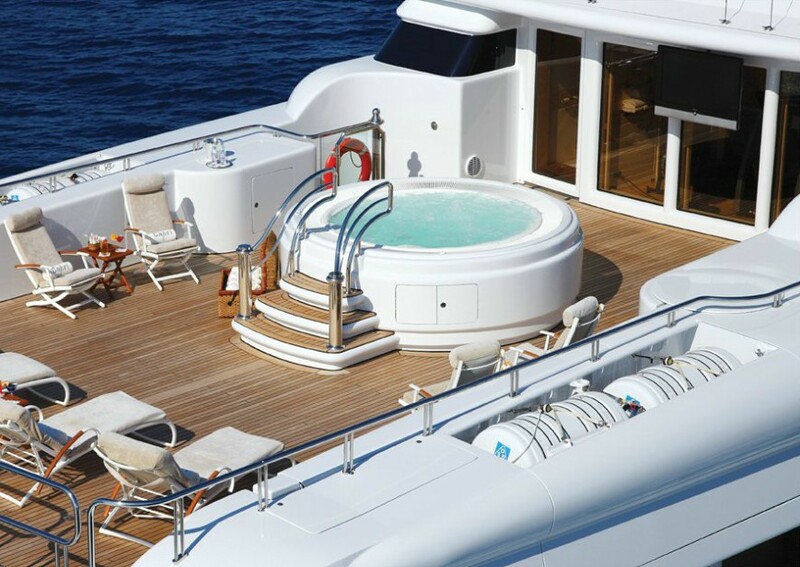 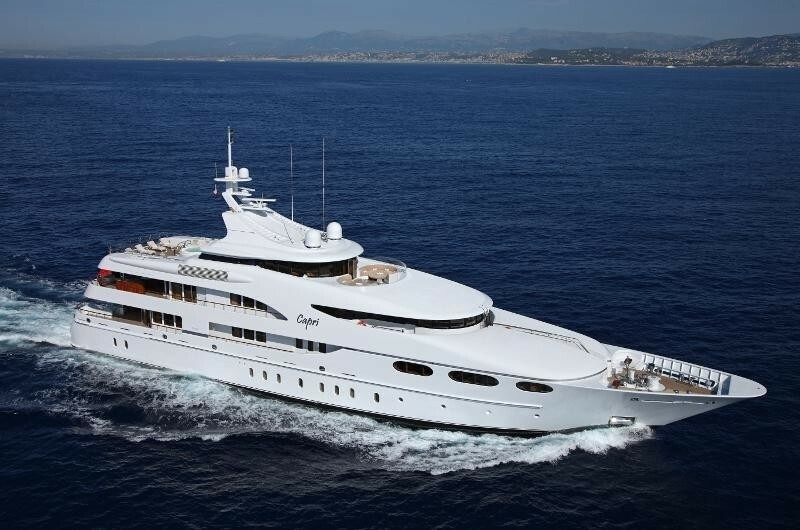 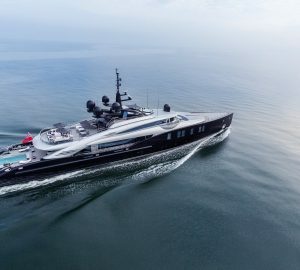 The superyacht's upper deck is Sheltered and ideal for relaxation in the Spa Pool, on the sun beds or just to take in the magnificent views. 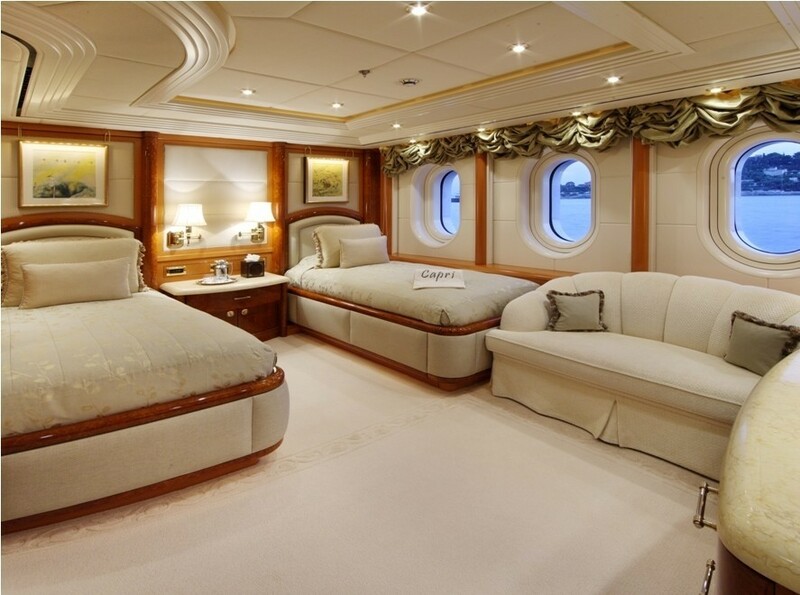 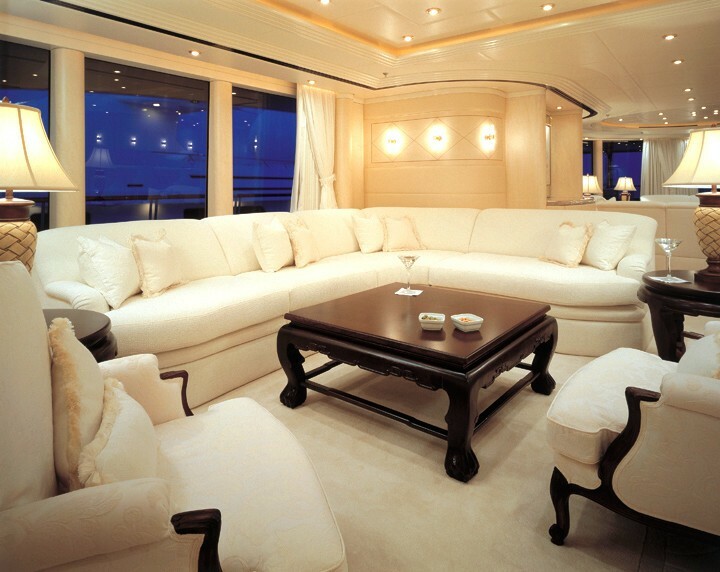 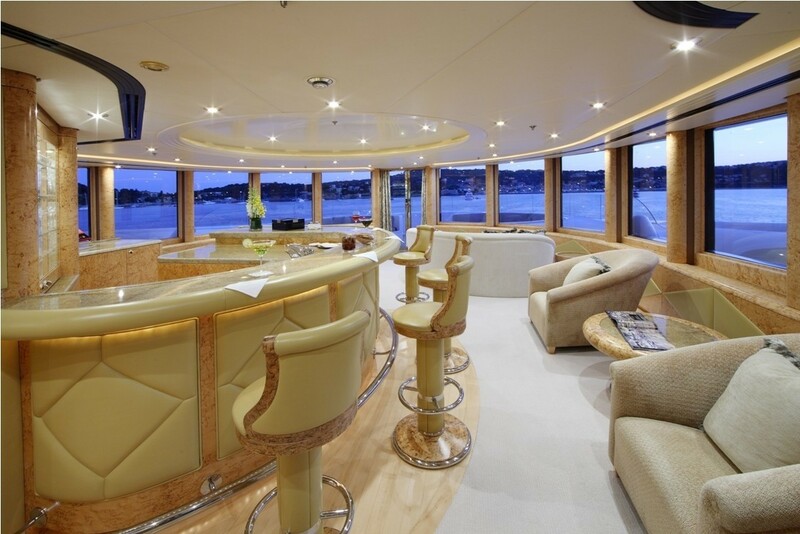 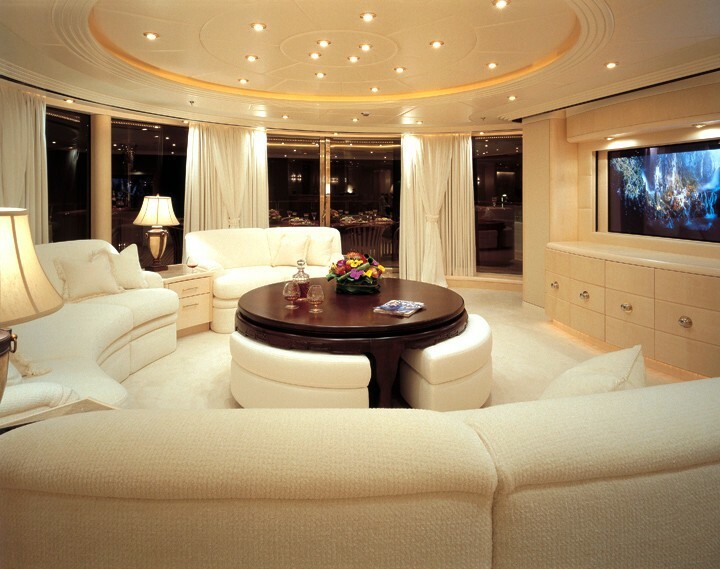 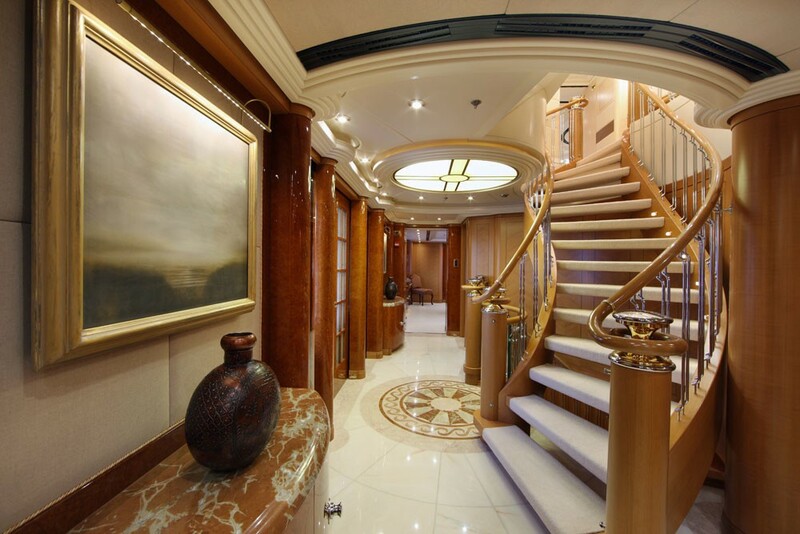 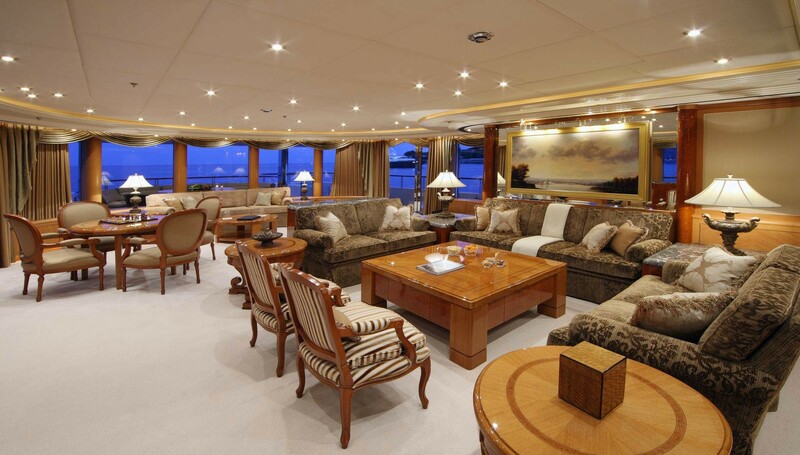 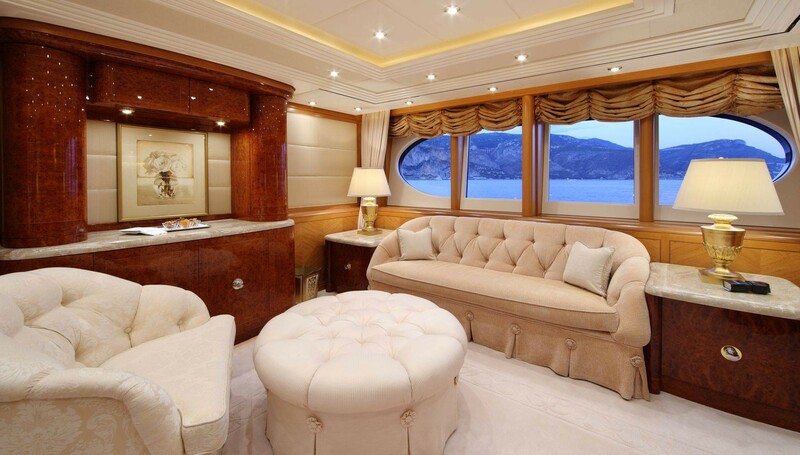 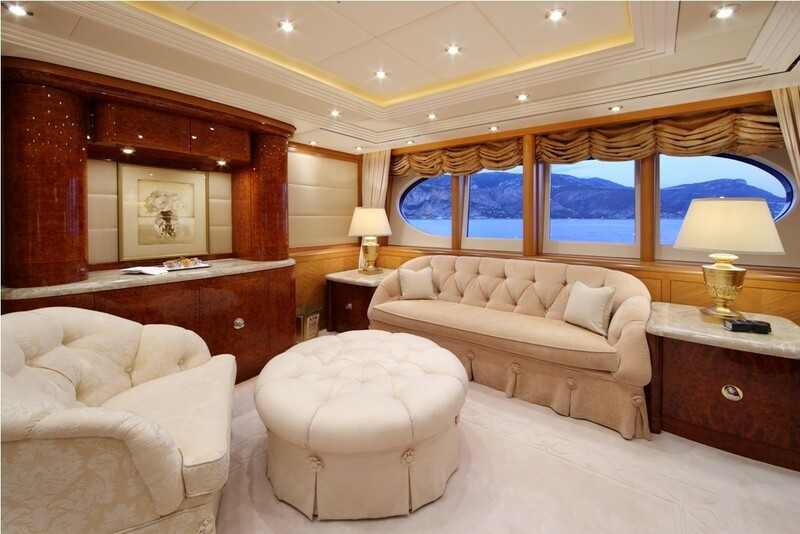 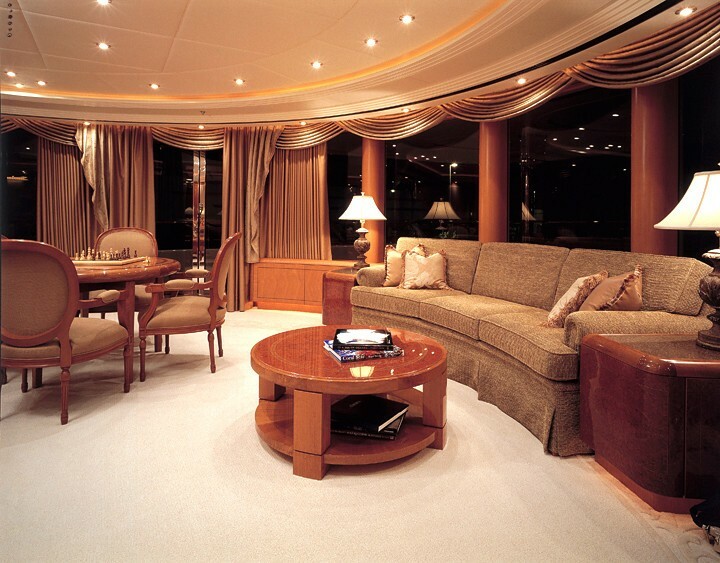 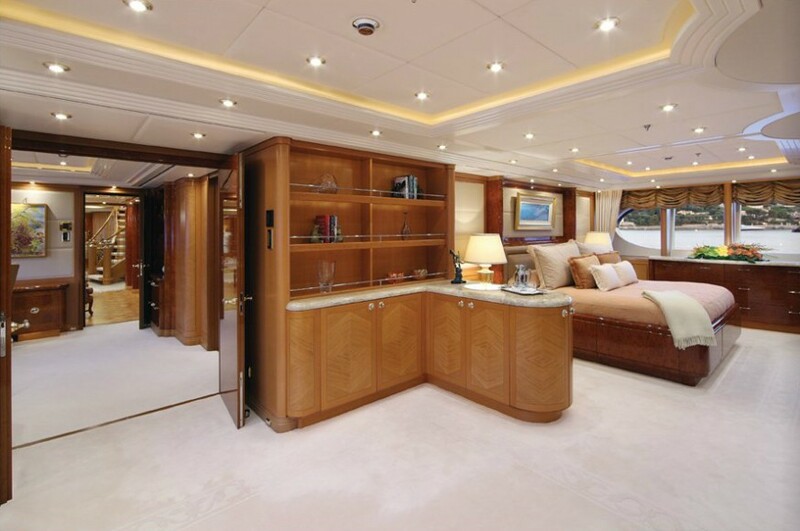 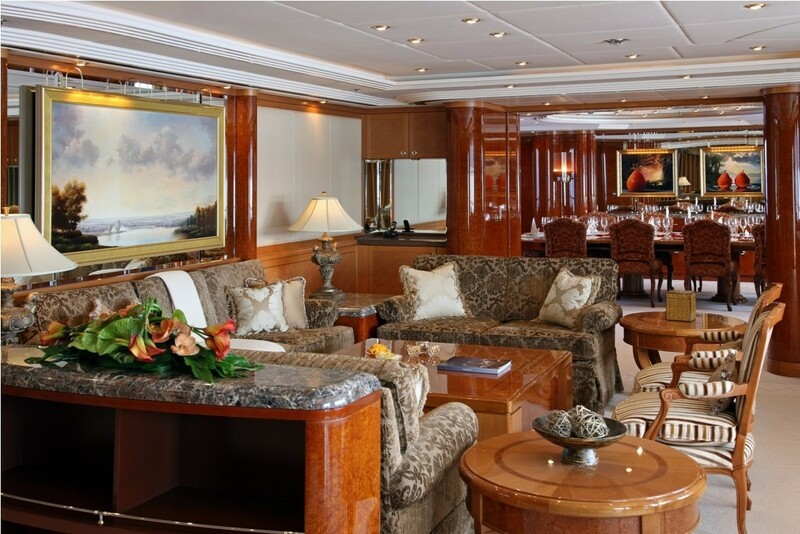 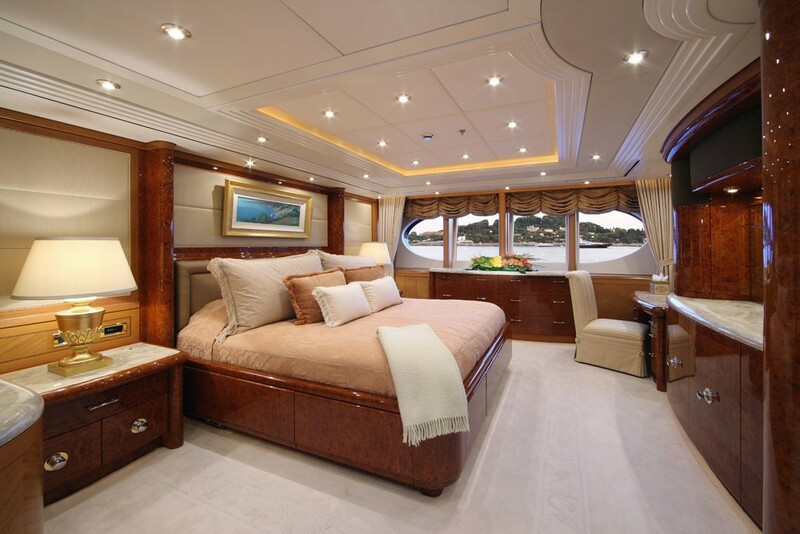 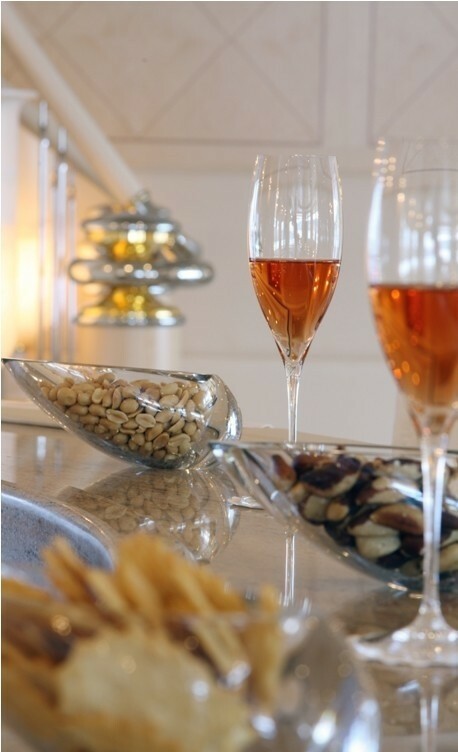 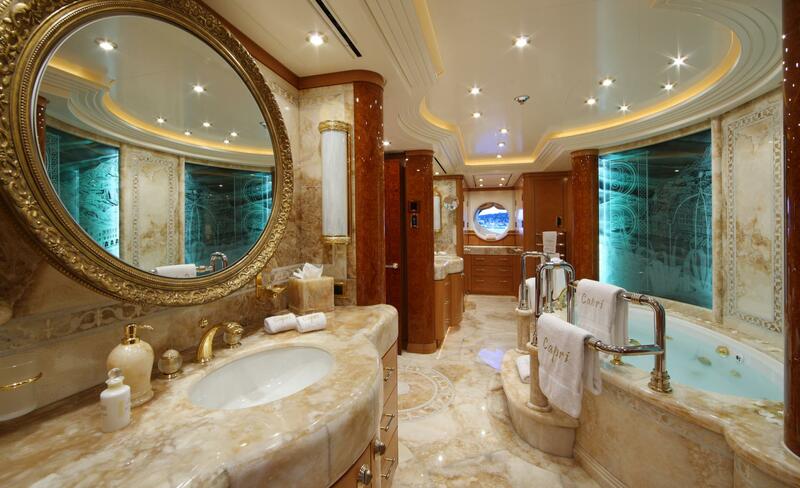 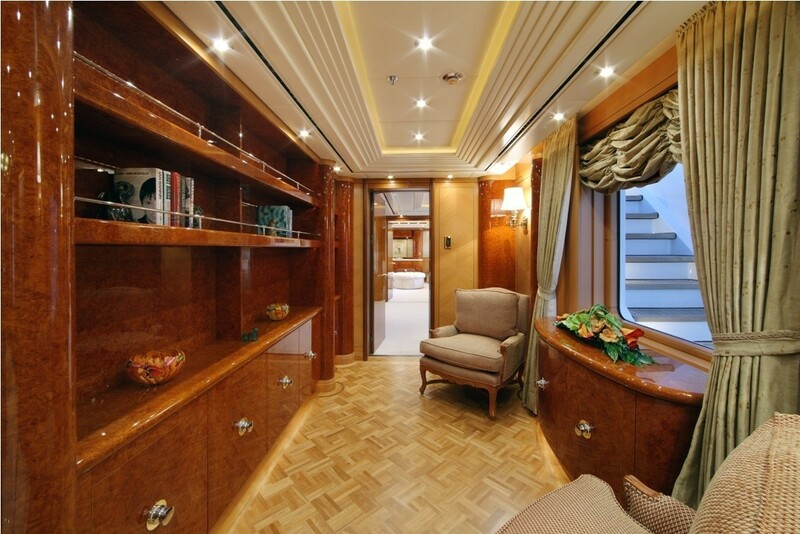 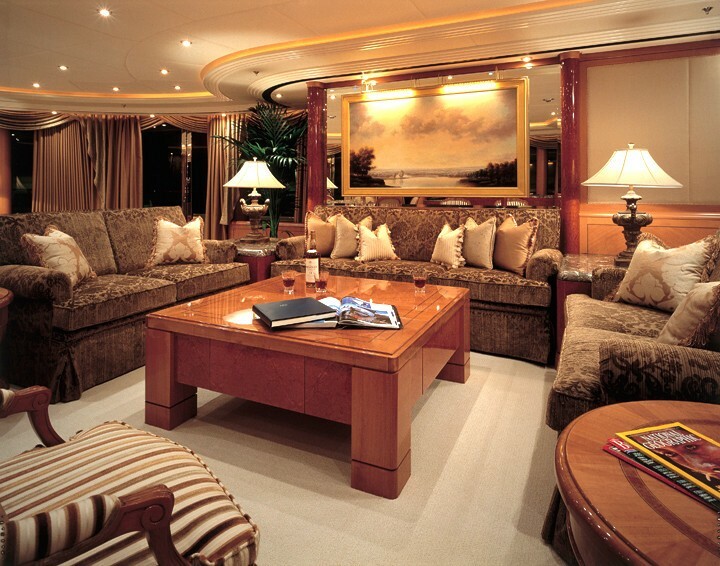 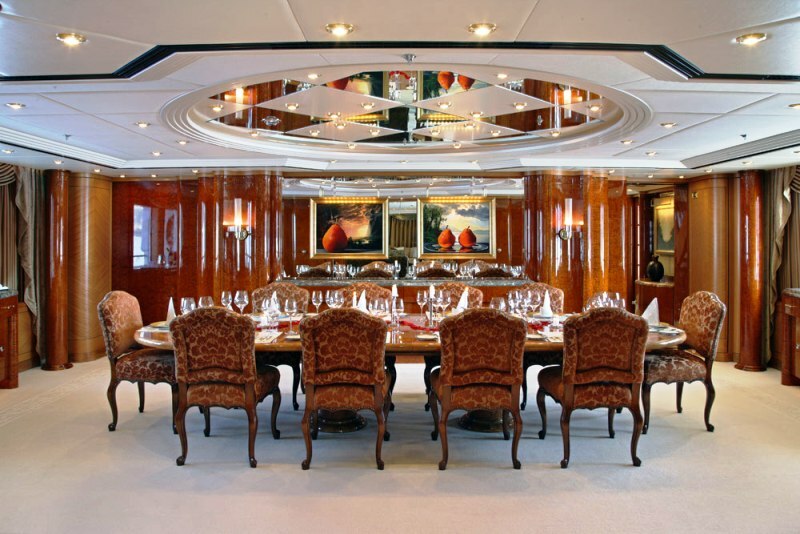 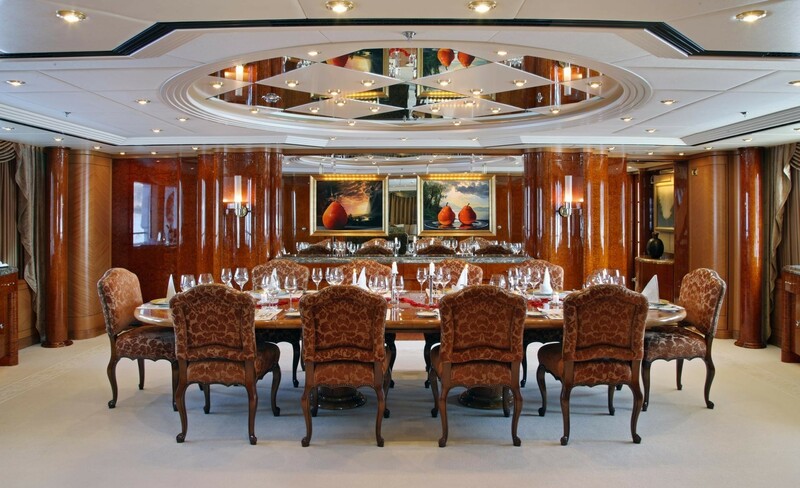 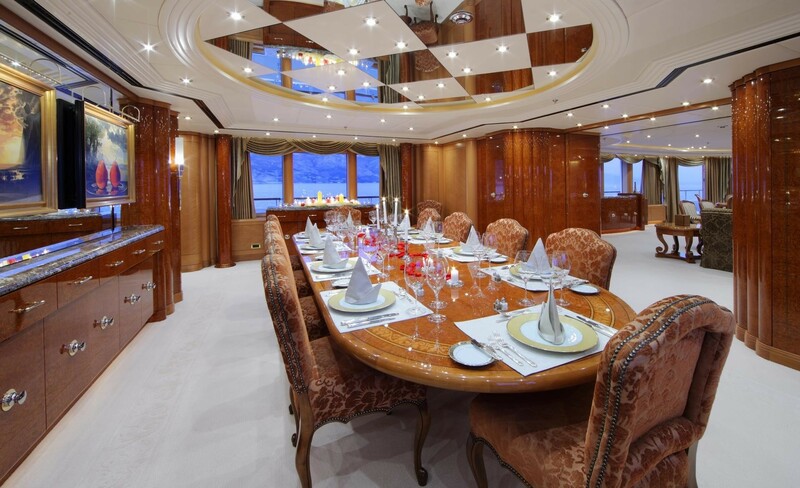 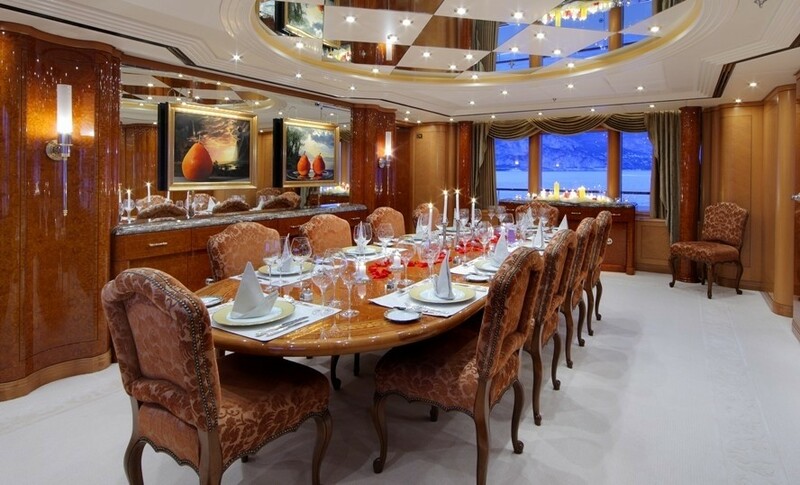 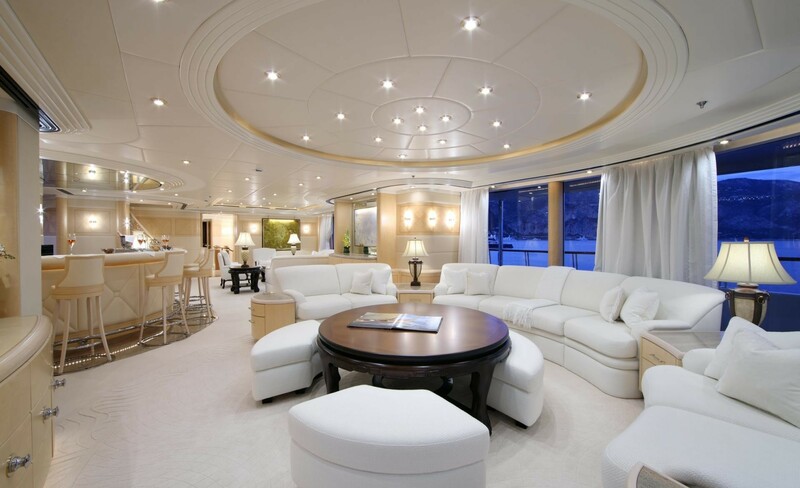 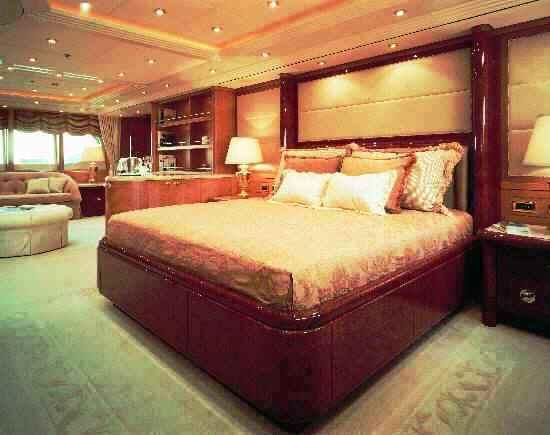 The warm and welcoming interior includes the elegant main saloon which stretches across the whole width of the boat and comes complete with numerous accessories such as 62" plasma screen, computer, entertainment room, stereo system and a special room for listening to music or for use as a private office. 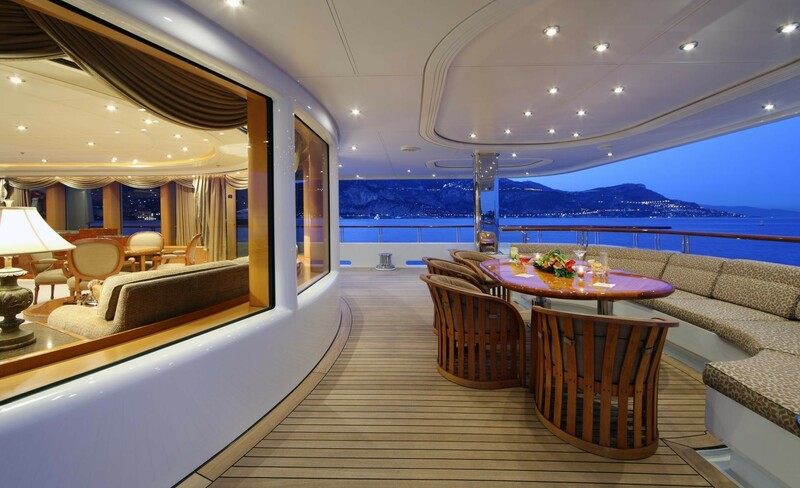 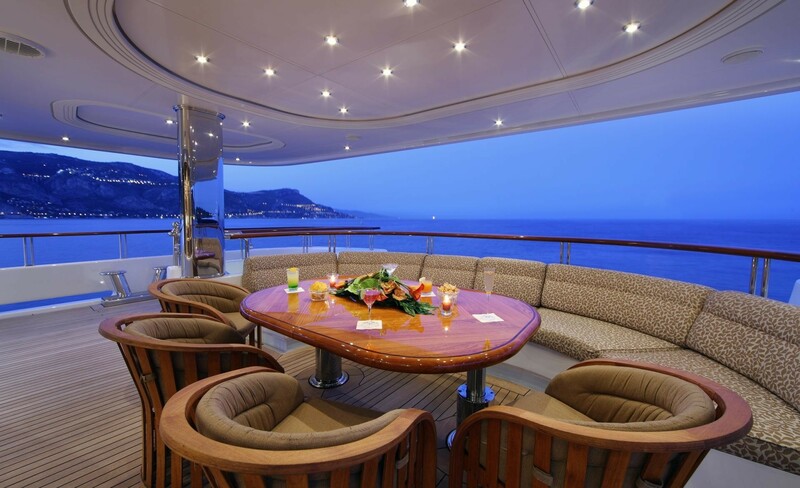 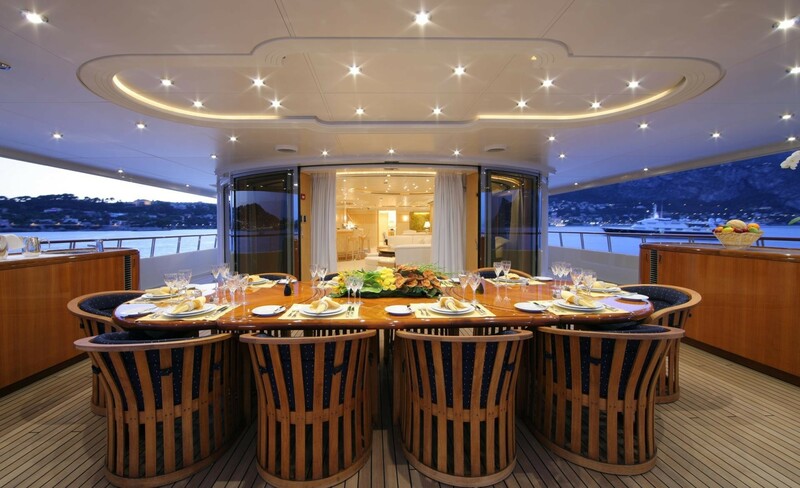 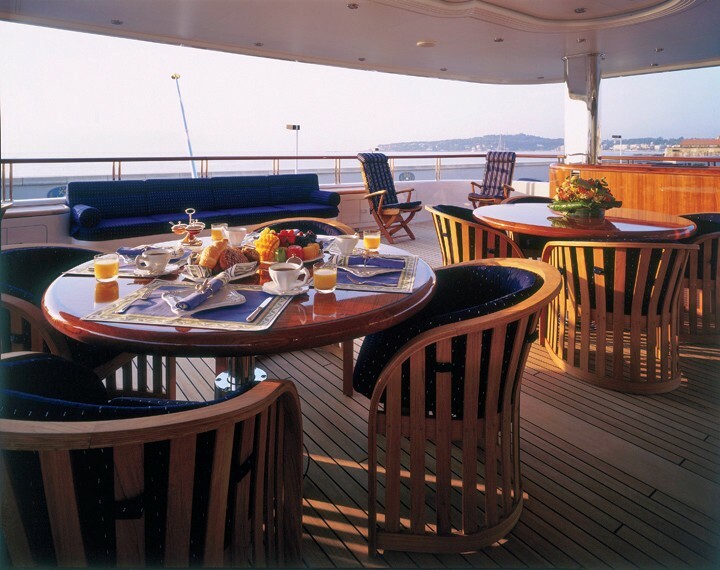 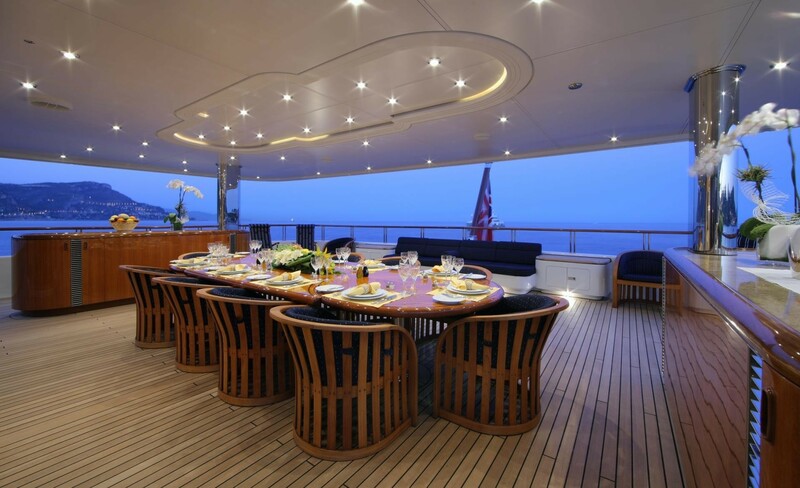 Also on this deck there is an open air saloon aft with sofas, independent stereo system and tables that can be joined together to create a single table seating up to 16 people. 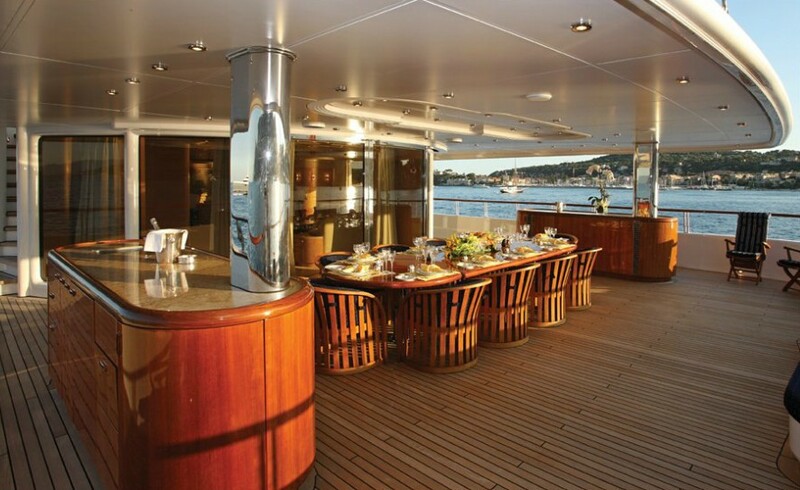 Completely protected by the sundeck, this area can be used in all weather conditions. 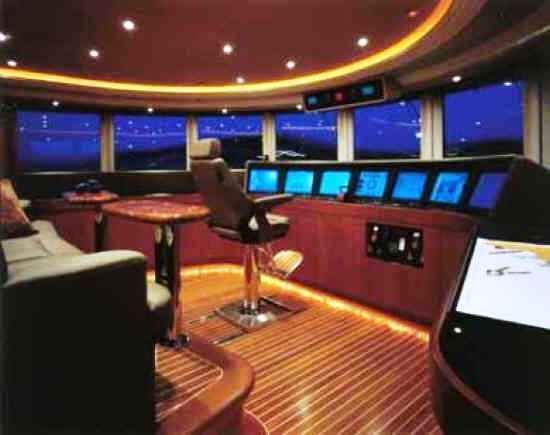 CAPRI's bridge is a true example of modern architecture and technology, with its array of electronic apparatus for management and control of all the on-board systems. An example of just some of the technology aboard Capri is the audio/video systems in every cabin, linked to a centralized unit that allows their use as satellite TV or DVD, as control panels for listening to music or for viewing information transmitted online by the main computer. 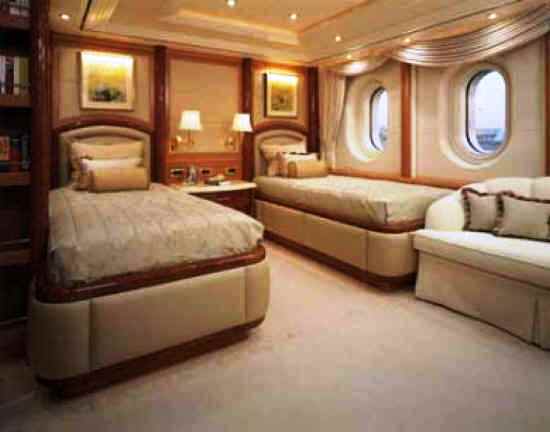 There are also another 10 screens at various points on board with professional sound systems that can be used in the same way as those in the cabins. 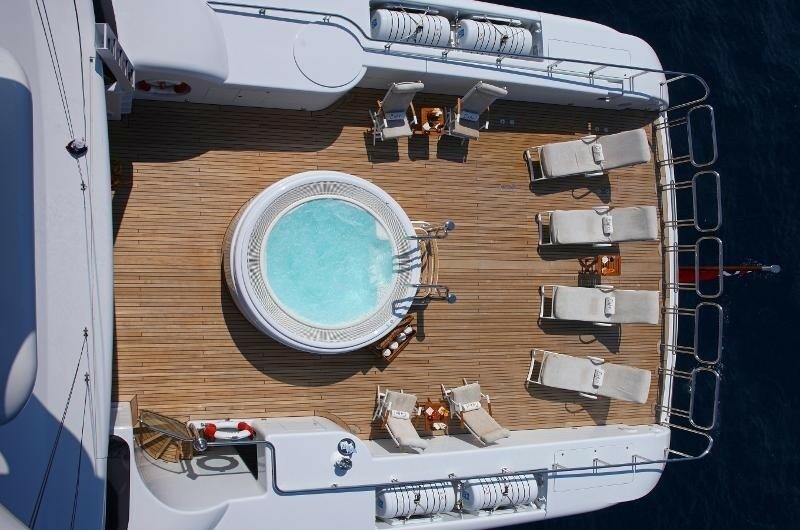 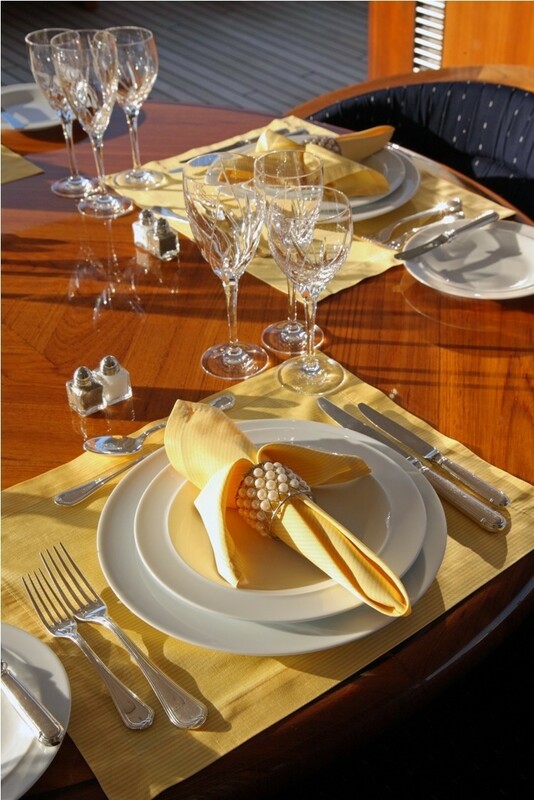 Capri can accommodate the owner and his guests in maximum comfort, offering standards of safety and reliability appropriate to a vessel of this kind, designed to sail everywhere and under all conditions. 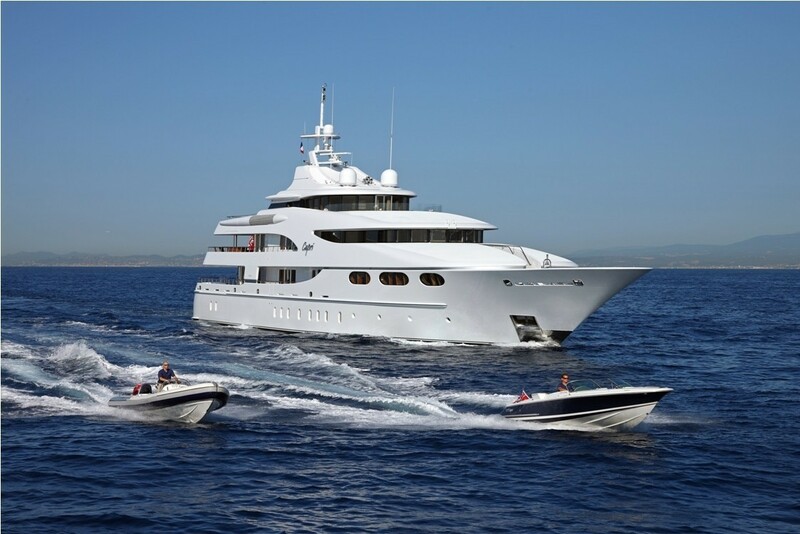 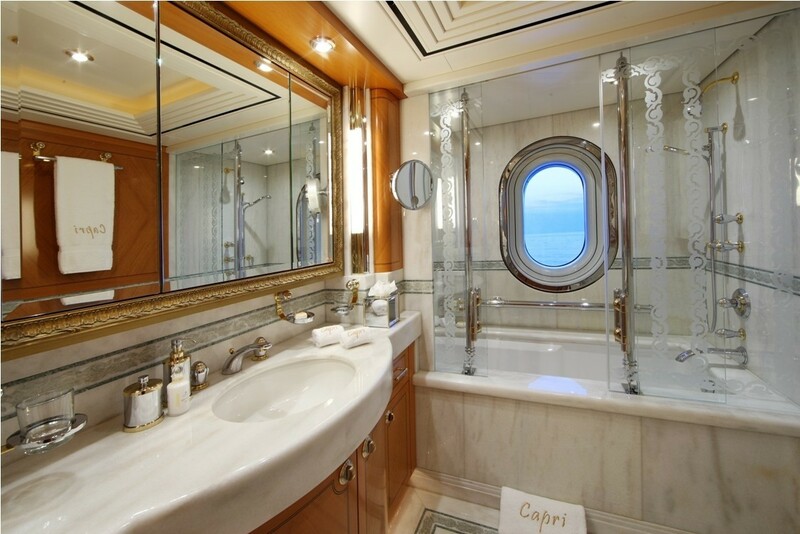 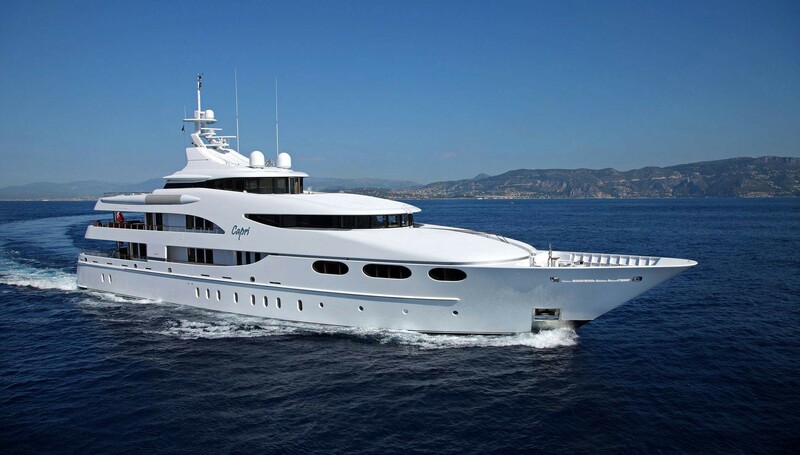 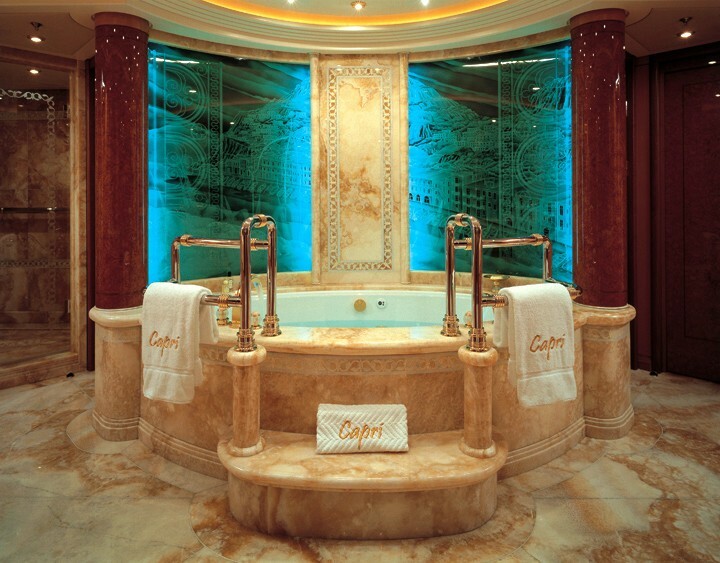 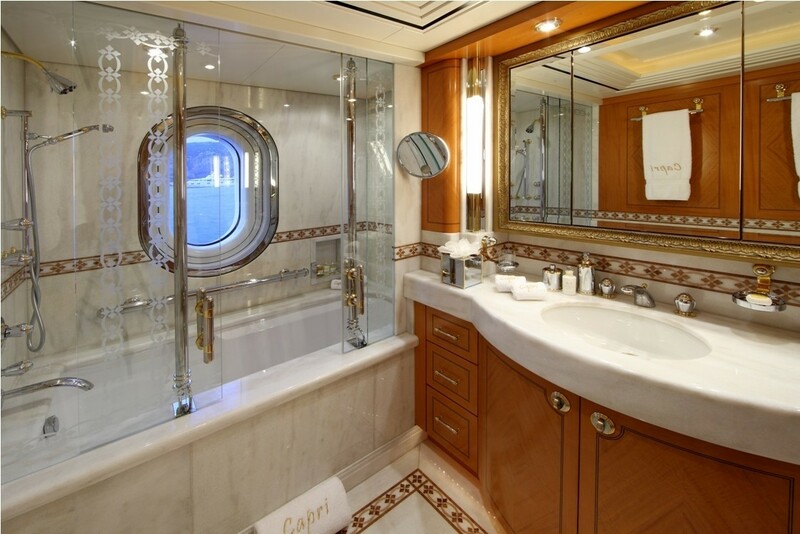 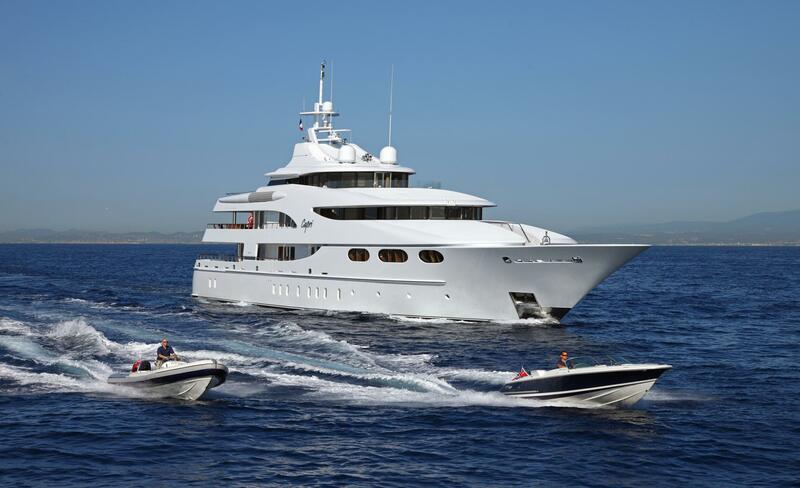 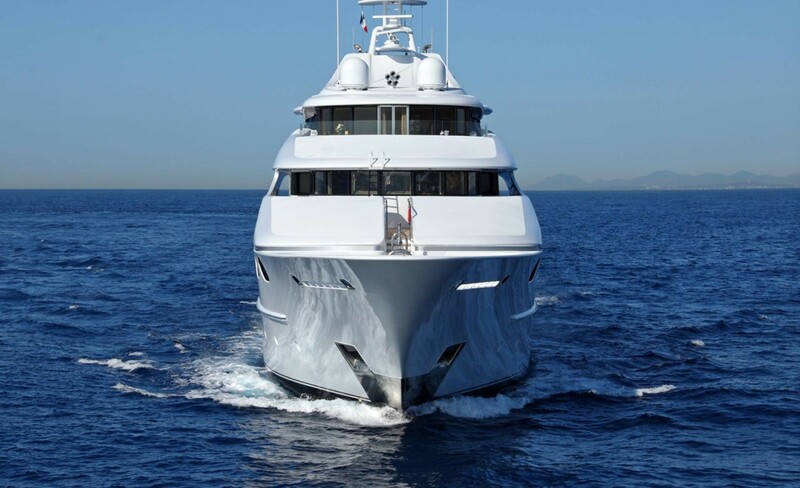 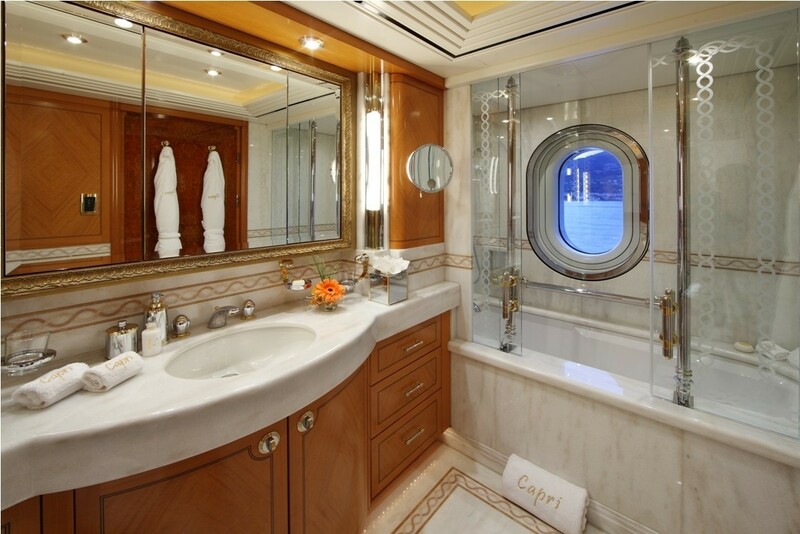 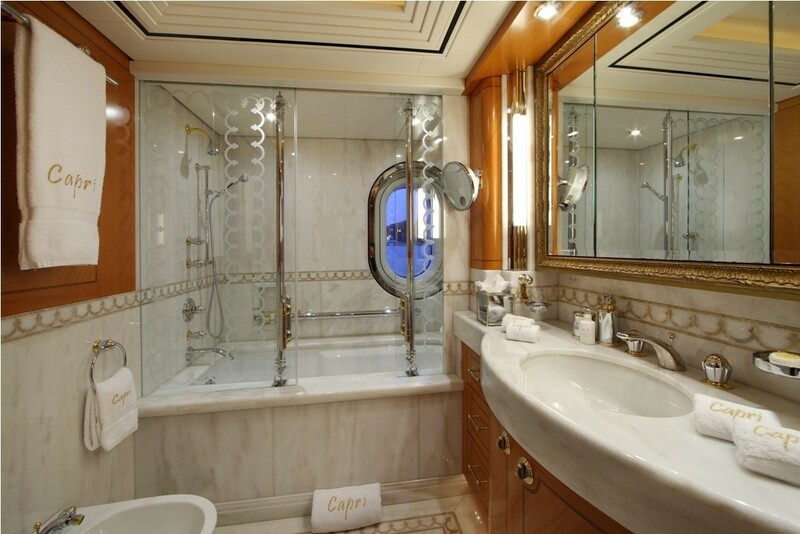 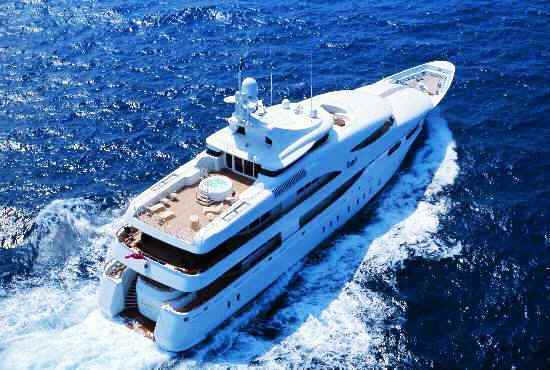 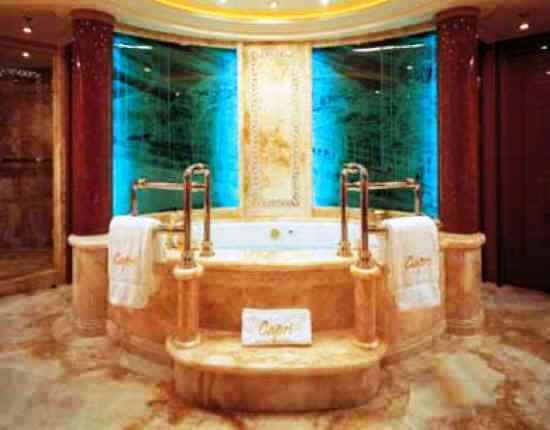 Yacht Capri offers six large cabins including the owner's cabin which is on the main deck and runs the whole width of the boat with a large bathroom and toilet. 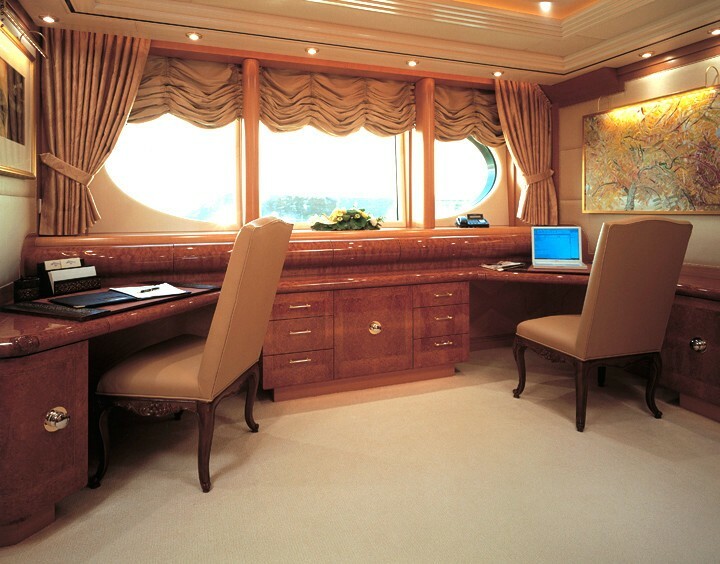 On the same deck there is the owner's office, with a room set aside as a library, and the VIP cabin with two double beds. 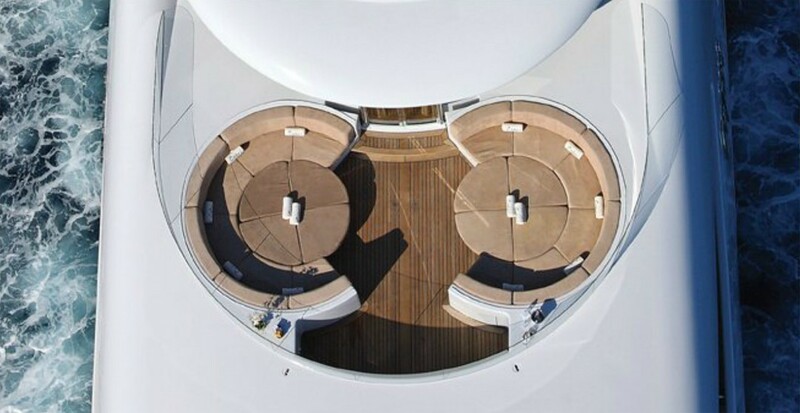 On the deck below there are four cabins of similar size, all with double beds and plenty of room. 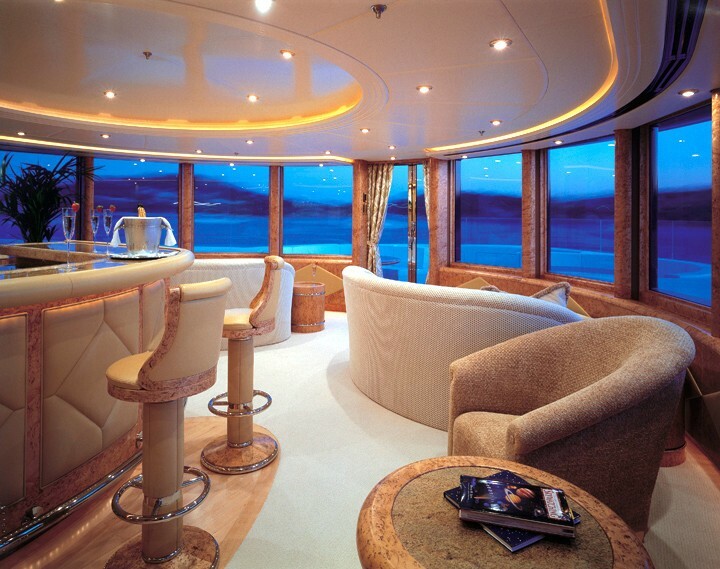 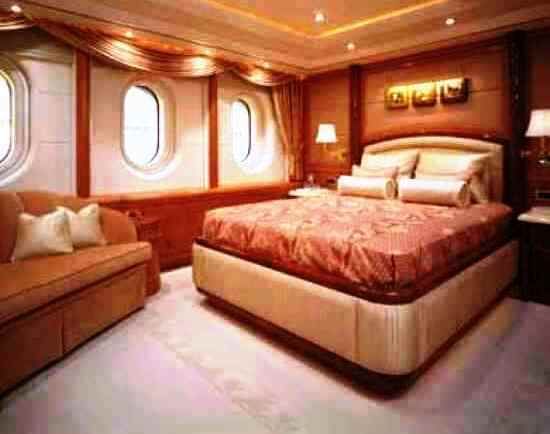 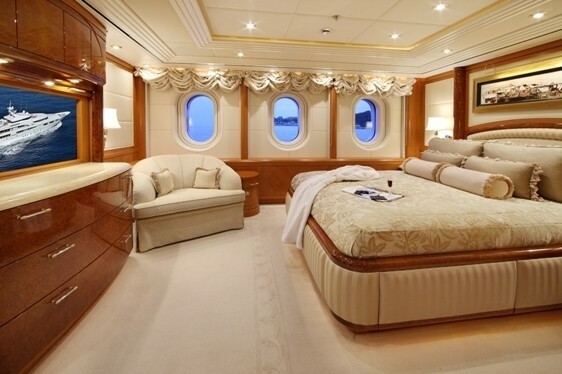 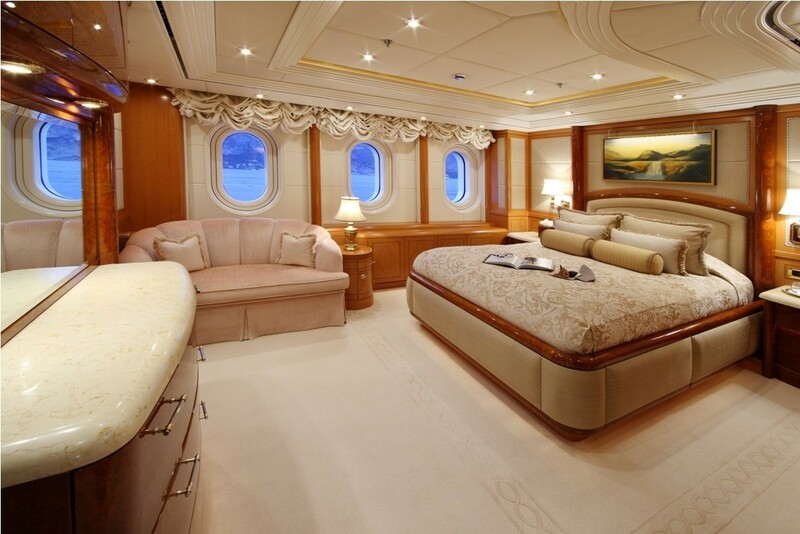 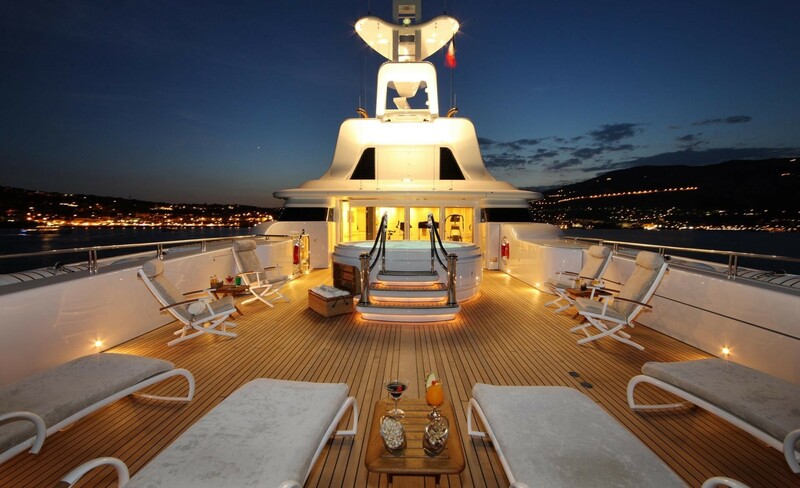 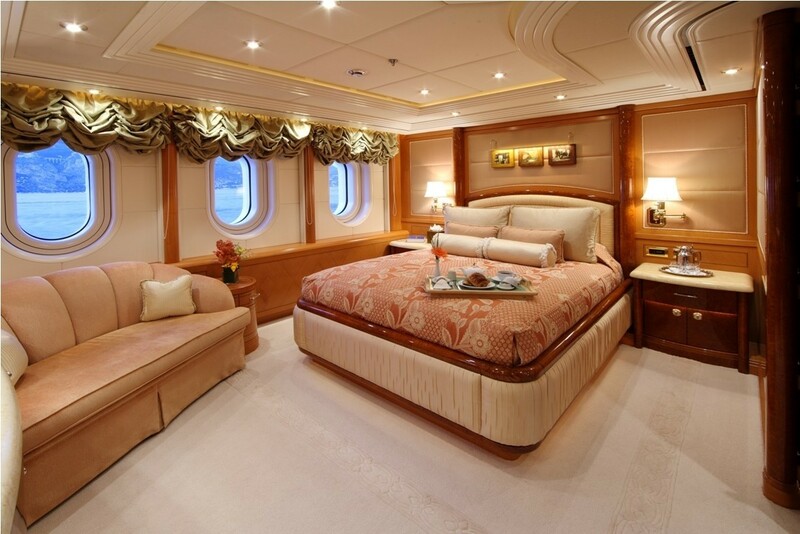 Forward on the same deck, the crew's quarters can accommodate the skipper and up to 14 crew.